“I am pleased about the panels,” says Laura Sewall, referring to the solar electric panels on the roof of the Bates Coastal Center at Shortridge, in Phippsburg, which she manages. That statement got twice as big on Oct. 6 when a team from Bates and from ReVision Energy placed a second helping of panels on the roof at the center. 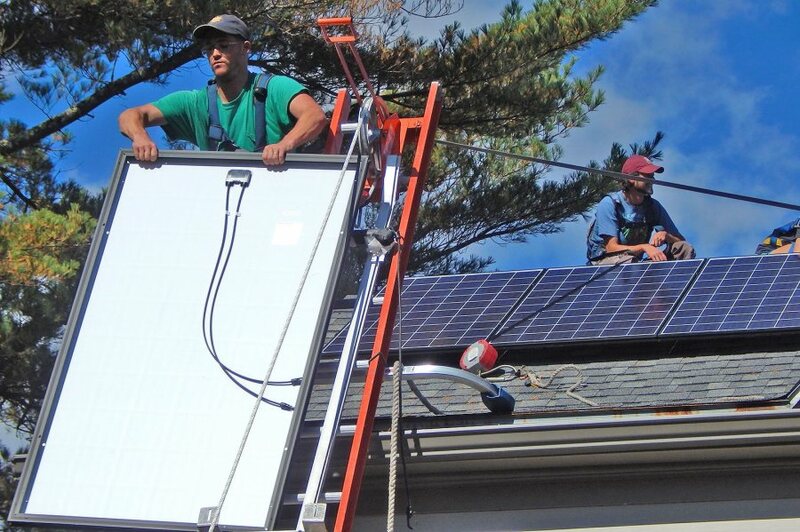 The 12 new panels complement a dozen installed in October 2016, also by Bates students and ReVision technicians. 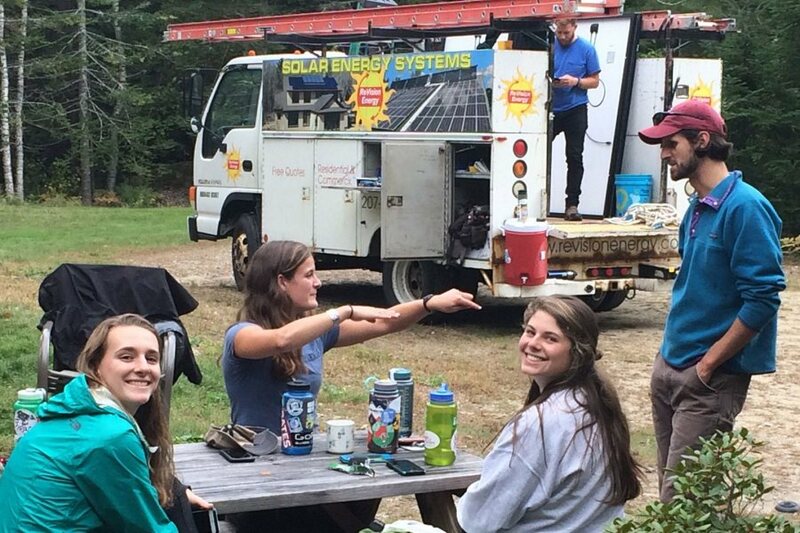 EcoReps install solar PV panels at the Bates Coastal Center on Oct. 6, 2017, and film each other doing it. Working with ReVision Energy’s Merritt Bussiere-Nichols (yellow shirt) are Matt Reback ’18 (green), Sophie Landes ’21 (dark plaid), Sophie Thayer ’18 (red shirt), and Liv Guion ’21 (red hat). The complete array’s peak output is six kilowatts, enough to meet (or surpass) the center’s electrical needs on any given day. “That makes the building 100 percent solar throughout the year” on average, says Tom Twist, Bates’ sustainability manager. Coming and going during the day on Oct. 6, a young alumna and 11 EcoReps took part in the installation at the retreat near the Bates–Morse Mountain Conservation Area. Teams took turns ascending to the Shortridge roof (two stories high, but it looks like three) to fasten panels onto metal rails and wire them up. Students on the ground used a ladder-and-pulley system to hoist the panels aloft. The Shortridge roof is two stories high, but it looks like three. Despite the pressure of classes on a weekday, “we had a good turnout,” says Twist, who organized the project with Sewall. One student even squeezed in an hour of labor first thing before heading back to campus for class. Bates EcoReps are students who pursue sustainability projects on campus under Twist’s direction. The alumna was Isobel Curtis ’17, a double major in biology and environmental studies who has spent the fall at Shortridge as a research coordinator. The new panels form a row below the original dozen. As in 2016, ReVision technicians visited in advance to lay the mounting rails and make the major electrical connections that will feed the sun-generated juice to the grid. Merritt Bussiere-Nichols was the ReVision technician directing the final push on Oct. 6. For the students, the panel installation “was surprisingly easy,” says Olivia Guion, a first-year from Arlington, Mass. “We had three or four people working at a time, each with a small, simple task, so the process was very streamlined. “It was a matter of pulling a panel up the ladder system, setting it against the metal tracks, clicking the wires into place, and tightening the screws to hold it down,” she explains. Merritt-Bussiere manhandled the panels from ladder to array. It’s too early to calculate the financial benefit of the full array, but indications from the first year, with 12 panels, are promising. Sewall estimates that the 2016 installation cut the center’s electric bill by more than half. For instance, the center paid about $152 for the month prior to the installation, and $61 for the month after. With the new capacity, “we may now be producing more power than we need.” Bates’s sustainability office covered the cost of the 2017 installation, approximately $10,000. 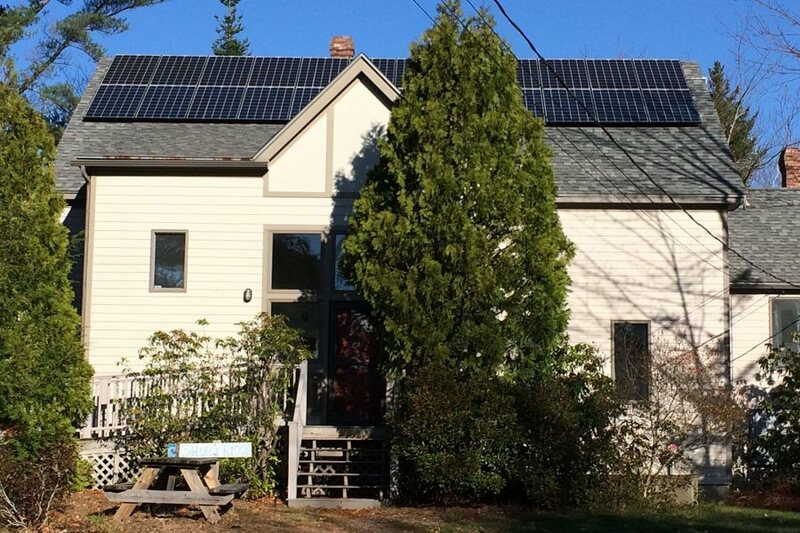 On its own terms, the full solar conversion is an important achievement. “Those panels will be doing their job for 45 years, so it’s a pretty big impact in terms of that building,” says Twist. But he also has a different kind of investment in mind: human capital. “The main focus of the project was to actually get students on the roof installing panels,” he explains. It’s good experience in and of itself, but it’s also about raising consciousness, both for the EcoReps and for people who learn about the project. And going the full monty with solar electricity harmonizes with one of Sewall’s dreams for the center: making it a showcase of sustainable practices. She’s thinking of things like detailed energy-use monitoring, heat pumps to complement the existing gas furnace, and even a charging station for electric vehicles. Not to mention battery storage for the solar-generated electricity, e.g. Tesla’s PowerWall. This is no small matter: Because of the way the solar array is tied to the regional grid, a failure of the grid means no juice for Shortridge. The center was dark for six days following the Oct. 30 storm that left so many Mainers without power. Bates people use Shortridge for retreats, class sessions, and as a base camp for research at the nearby conservation area, with its woods, salt marsh, and beach. Up a long driveway from the road, surrounded by trees and set near a pond, the center’s location is ideal. So there’s a certain unity to using the building to model ways of protecting its natural setting. “I think anyone who has been to Shortridge will agree that it feels like an oasis from the hectic atmosphere of campus,” Curtis says.